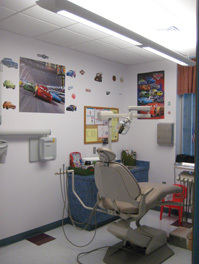 Our exam rooms are sure to make you smile. 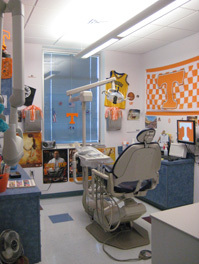 The Monroe County Dental Clinic has been serving East Tennesseans for more than 35 years, and is equipped to meet all of your oral health needs…including cleanings, fillings, crowns, bridges, extractions, partials, and dentures. 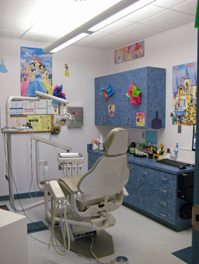 The caring staff at Monroe County Dental Clinic is committed to making your visit comfortable. Dental assistants: Kristy and Emily, and Hygienist LeAnne are lifelong residents of Monroe County, and are dedicated providers of quality care. Doctor William Paul Brakebill, Jr is a graduate of the University of Tennessee College of Dentistry, and are focused on helping you optimize your dental health and your sparkling smile. You will be greeted with a smile by our front desk ladies Betty and Tammy. Our commitment to adopting new, proven-safe technologies like digital radiography (a filmless digital X-ray) helps us to provide our patients with dental care in keeping with best medical practices. 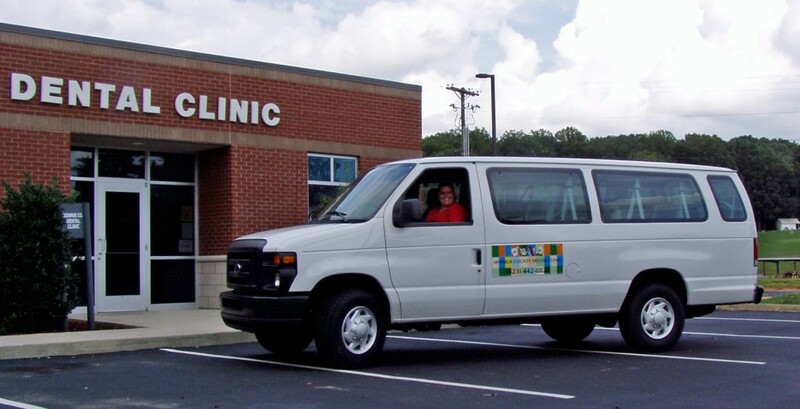 During the school year, the clinic provides roundtrip transportation between school and the clinic (during school hours) to help its K-12 patients with visits to the dentist. For more information about this program, please click on the transport van below. We welcome patients of all ages from Monroe and surrounding counties, and, as a self funded (non-taxpayer supported) entity, must charge for services provided. Some Monroe County residents may be eligible to receive care at reduced fees…for more information, CLICK HERE. Please do not call to schedule your first reduced fee appointment. Program rules require that you visit the clinic in person to schedule this appointment. Our office accepts most dental insurance plans including TennCare, and we will be happy to accept payments for services not covered by insurance in cash or by check or by credit cards*. *Convenience fee of credit card usage of 2.75%. Please call the office for details. From Sweetwater, take New Highway 68 toward Madisonville. past Thompson Road on your left. From Madisonville, take New Highway 68 toward Sweetwater. just under ½ mile past Watson Chapel Road on your right.